Rubber Room Ramblings: FLIGHT OF THE BUTTERFLY! Here is a card I swapped with Kelly Kluesner in Ohio. 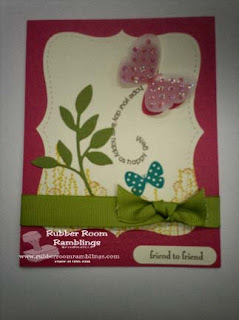 She used the Flight of the Butterfly stamp set and the little butterfly on top is stamped on vellum and the wings lift up. It is too cute!